To be given the opportunity to appear at this festival was pretty special. I’d heard great things about the weekend so it was no surprise that I had a whole load of fun while I was there! I’d travelled up to Hawarden estate on my own that day, sadly leaving my family behind. We just couldn’t fit this one into our family schedule, so, on my todd I wandered the festival for a couple of hours. Of course I’d have loved to have the rest of them there with me, but actually this was a great opportunity. The chance to stop, chat and learn from some of the brilliant crafts people without a toddler attached to my leg, a child on my shoulders and another one pulling me this way and that was a rare and pretty enjoyable experience. It’s impossible to mention everything that was going on, the site was jam packed with interesting activities, talks, people, music, food, drink, crafts and outdoor experiences. I only scratched the surface in one afternoon. There was a friendly feel throughout, it was the perfect place to go as a family, on your own, as a couple or with a group of friends. Incidentally I met up with some friends while I was there and had a great time chatting as we watched everything that was going on. Grabbing myself a pint of delicious, strong cider that I’d been eyeing up, I took to the stage as the sun started to set. I was there to promote Dadventures, sell a few books and give a talk about life on water and life as an active outdoorsy dad. As I stepped up to the stage I wondered if the cider had been a good idea!? Thankfully the tent was packed with friendly faces, there was a brilliant audience that night and I loved every second of the hour I had standing up there talking. If you were there, thank you, I hope you enjoyed listening as much as I enjoyed speaking! 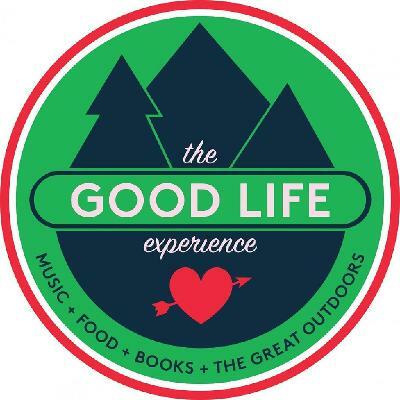 Visiting The Good Life Experience is a good plan. I’d highly recommend it whether it’s for the day or for the whole weekend. The philosophy of the whole event is just simply good. I’ll be heading back next year with our troop, hopefully see you there! Also worth checking out The Mavericks Podcast created by Charlie Gladstone, one of the founders of The Good Life Experience. I’m pleased to call Charlie my friend, it’s all about ‘people who have swum against the tide - doers and creators.’ and it’s brilliant, just like him.